Miniatures for Violin and Piano. Debussy Children¹s Corner ­ Golliwog¹s Cakewalk. Albéniz Sevilla, Op. 47 No. 3. Brahms Wie Melodien zieht es mir, Op. 105 No. 1. Godowsky Triakontameron ­ No. 11, Alt Wien. Hummel Rondo in E flat, Op. 11, 'Rondo favori'. Schubert Impromptu in G flat, D899 No. 3. Dinicu Hora staccato (all arr. Heifetz). Gershwin/Heifetz Five Fragments from 'Porgy and Bess'. Elena Denisova (violin); Alexei Kornienko (piano). Elena Denisova's warm, throaty violin sound and great facility with stratospheric harmonics means that this repertoire is perfect for her technique. This is an admirably chosen selection of Heifetz' many arrangements for violin and piano and one which will give much pleasure to all. Pianistic purists may balk at an arrangement of Schubert's G flat Impromptu, but there is no denying its effectiveness. It also gives Denisova an opportunity to show off her legato: her bow is seemingly never-ending. Many of the other arrangements have a sense of fun as their first priority. The opening Golliwog's Cakewalk exemplifies this perfectly and at once establishes Denisova's facility. In fact the planing of the recital is exemplary: reflective, lyrical arrangements (the recontextualisation of the Vivaldi Larghetto, the Brahms song) alternate and react with the showy (Weber's Rondo) and the positively outrageous (Milhaud's Brazilejra). At the centre of this recital stands the Five Fragments from 'Porgy and Bess'. Denisova particularly excels in the yearning quality of Bess, you is my woman now. In fact, it is the rare mix of virtuosity and lyrical projection which distinguishes Denisova's playing. 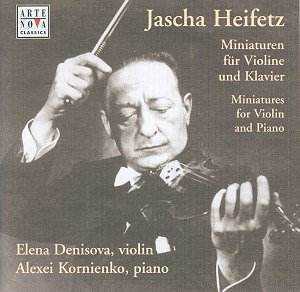 As an introduction to Heifetz's by turns nostalgic and virtuosic world, this disc will stand you in good stead.